Ali Gohar in restorative jirga (2012). Photo: John Braithwaite. G. Burford, J. Braithwaite and V. Braithwaite (eds.) (2019) Restorative and Responsive Regulation of Human Services. New York: Routledge. J. Braithwaite, G. Burford & V. Braithwaite (2019) ‘Learning from the Human Services: How to Build Better Restorative Justice and Responsive Regulation’. In G. Burford, J. Braithwaite & V. Braithwaite (eds.) Restorative and Responsive Human Services (pp. 210-234). New York: Routledge. J. Braithwaite (2018) ‘Criminology, Peacebuilding and Transitional Justice: Lessons from the Global South‘. In K. Carrington, R. Hogg, J. Scott, M. Sozzo (eds.) The Palgrave Handbook of Criminology and the Global South (pp. 971-990). London: Palgrave Macmillan. Braithwaite, John (2018) ‘The future of restorative justice’. In Routledge International Handbook of Restorative Justice. Oxon: Routledge. J. Braithwaite and Y. Zhang (2017) ‘Persia to China: the Silk Road of Restorative Justice I‘ Asian Journal of Criminology 12(1):23-38. J. Braithwaite (2016) Restorative Justice and Responsive Regulation: The question of evidence. RegNet Working Paper No. 51, School of Regulation and Global Governance (RegNet). This is an update of an earlier 2014 version of this paper. Also available at SSRN. J. Braithwaite (2016) ‘Redeeming the ‘F’ word in Restorative Justice’ Oxford Journal of Law and Religion 5(1), 79-93. J. Braithwaite (2016) ‘Learning to Scale up Restorative Justice’ in K. Clamp (ed.) Restorative Justice in Transitional Settings, 173-189. Abingdon: Routledge. J. Braithwaite (2015) ‘Deliberative Republican Hybridity through Restorative Justice’ Raisons politiques 59(3), 33-49. J. Braithwaite (2015) ‘Paralegals Changing lenses’ Restorative Justice: An International Journal 3(3), 311-324. J. Braithwaite (2014) Traditional justice in Jennifer Llewellyn and Daniel Philpott (eds.) Restorative Justice, Reconciliation and Peacebuilding. New York: Oxford University Press. J. Braithwaite (2014) Foreword in D.Cornwell, J. Blad & M. Wright (eds) Civilising Criminal Justice: An international restorative agenda for penal reform. New York: Oxford University Press. J. Braithwaite and T. Rashed (2014) ‘Restorative Justice: Lessons from Libya’ Restorative Justice: An International Journal, February, Special Report, 1-8. J. Braithwaite and T. Rashed (2014) ‘Nonviolence and Reconciliation among the Violence in Libya’ Restorative Justice: An International Journal 2(2), 185-204. R. Nickson and J. Braithwaite (2014) ‘Deeper, Broader, Longer Transitional Justice’ European Journal of Criminology 11(4), 445-463. J. Braithwaite (2014) ‘Restorative Justice and Responsive Regulation: The Question of Evidence’ RegNet Research Paper No. 2014/51. J. Braithwaite (2013) Foreword in T. Gavrielides, V. Artinopoulou (eds) Reconstructing Restorative Justice Philosophy, xiii-xv. J. Braithwaite (2013) ‘Flipping markets to virtue with qui tam and restorative justice’ Accounting Organizations and Society 38(6-7), 458-468. J. Braithwaite (2013) ‘Western Words’ Restorative Justice: An International Journal 1(1), 20-22. J. Braithwaite (2013) Foreword in D.Cornwell, J. Blad & M. Wright (eds) Civilising Criminal Justice: An international restorative agenda for penal reform. United Kingdom: Waterside Press. J. Braithwaite and A. Wardak (2013) ‘Crime and war in Afghanistan. Part 1: the Hobbesian solution’ The British Journal of Criminology 53, 179-196. A. Wardak and J. Braithwaite (2013) ‘Crime and war in Afghanistan. Part 2: A Jeffersonian alternative?’ The British Journal of Criminology 53, 197-214. J. Braithwaite (2012) Foreword in J. Bolitho, J. Bruce and G. Mason (eds) Restorative Justice: Adults and Emerging Practice, viii-xi. Sydney: NSW Institute of Criminology Press. J. Braithwaite (2012) Preface in T. Gavrielides (ed.) Rights and Restoration within Youth Justice, 1-4. Whitby CA: De Sitter Publications. J. Braithwaite (2012) Responsive freedom (chapter 1.8.) in Sam Muller and Stavros Zouridis (eds) Law and Justice: A strategy perspective. The Hague: Torkel Opsahl Academic EPublishers. J. Braithwaite (2012) ‘Paradox and civic republicanism vision’ Nevada Journal of Law 12(333), 333-340. H. Huang, V. Braithwaite, H. Tsutomi, Y. Hosoi & J. Braithwaite (2011) ‘Social capital, rehabilitation, tradition: support for restorative justice in Japan and Australia’ Asian Journal of Criminology 7(4), 295-308. J. Braithwaite (2009) ‘The Effect of Restorative Justice’ Journal of National Prosecutors College China 17(4), 41-45. J. Braithwaite (2009) ‘Restorative Justice’ in H.J. Schneider (ed.) International Handbook of Criminology, 497-506. Berlin: Walter de Gruyter. J. Braithwaite (2009) ‘Restorative justice for banks through negative licensing’, The British Journal of Criminology 49(2), 439-450. E. Ahmed and J. Braithwaite (2011) Shame, pride and workplace bullying in S. Karstedt, I. Loader and H. Strang (eds) Emotions, Crime and Justice. Oxford: Hart Publishing, forthcoming. J. Braithwaite (2007) Building Legitimacy Through Restorative Justice in T. Tyler (ed.) Legitimacy and Criminal Justice: International Perspectives, 146-162. New York: Russell Sage. J. Braithwaite (2007) ‘Encourage Restorative Justice‘ Criminology and Public Policy 6 (4), 689-696. J. Braithwaite (2007) Foreword in B. Morrision Restoring Safe School Communities, v. Leichhardt: Federation Press. J. Braithwaite (2006) ‘Doing Justice Intelligently in Civil Society’ Journal of Social Issues 62(2), 397-407. J. Braithwaite (2006) ‘Narrative and “Compulsory Compassion”‘ Law and Social Inquiry 31(2), 425-446. J. Braithwaite (2006) ‘Responsive Regulation and Developing Economies’ World Development 34(5), 884-898. J. Braithwaite (2006) ‘Shufukuteki Shihou’ (Restorative Justice: Overview of the Concept) in Yoko Hosoi, Haruo Nishimura, Shirou Kashimuri andBunri Tatsuno (eds) Shufukuteki Shiho Sougouteki Kenkyu (Restorative Justice: An Overview of Research, 24-34). Tokyo: Kazamashobo. J. Braithwaite (2006) Peacemaking Networks and Restorative Justice in J. Flemming & J. Wood (eds) Fighting Crime Together: The Challenges of Policing and Security Networks, 195-217. Sydney: UNSW Press. J. Braithwaite (2005) ‘Between Proportionality and Impunity: Confrontation => Truth => Prevention, The American Society of Criminology 2004 Sutherland Address’ Criminology 43(2), 283-306. (Reprinted in C. Slakmon, Machado & P. Bottini (eds) (2006) Novas Direções no Goverança da Justiça e da Segurança (New Directions in the Governance of Justice and Security, 371-388.). Brasília-D.F. : Ministry of Justice of Brazil, United Nations Development Programme – Brazil & the School of Law of the Getulio Vargas Foundation – São Paulo). E. Ahmed and J. Braithwaite (2005) ‘Forgiveness, Shaming, Shame, and Bullying’ Australian and New Zealand Journal of Criminology 38(3), 298-323. J. Braithwaite, E. Ahmed and V. Braithwaite (2005) ‘Shame, Restorative Justice and Crime‘ Advances in Criminological Theory 15, 397-417. J. Braithwaite (2004) ‘Families and the Republic’ Journal of Sociology and Social Welfare 31(1), 199-215. N. Harris, L. Walgrave and J. Braithwaite (2004) ‘Emotional Dynamics in Restorative Conferences’ Theoretical Criminology 8(2), 2004, 191-210. J. Braithwaite (2004) ‘Restorative Justice and De-Professionalization’ The Good Society 13(1), 2004, 28-31. J. Braithwaite (2003) ‘Holism, Justice and Atonement’ Utah Law Review 1, 389-412. J. Braithwaite (2003) Principles of Restorative Justice in A. von Hirsch, J.V. Roberts, A.E. Bottoms, K. Roach and M. Schiff (eds) Restorative Justice and Criminal Justice: Competing or Reconcilable Paradigms?, 1-20. Hart Publishing: Oxford. J. Braithwaite (2003) Restorative Justice and Corporate Regulation in Elmar G.M. Weitekamp and Hans-Jürgen Kerner (eds). Restorative Justice in Context. International Practice and Directions, 161-172. Devon, UK: Willan Publishing. J. Braithwaite (2003) Does Restorative Justice Work? in Gerry Johnstone (ed) A Restorative Justice Reader: Texts, Sources, Context, 320-352. Devon, UK: Willan Publishing. J. Braithwaite (2003) ‘The Fundamentals of Restorative Justice’ in S. Dinnen, A. Jowitt and T. Newton (eds) A Kind of Mending: Restorative Justice in the Pacific Islands, 35-43. Canberra: ANU Press. J. Braithwaite (2002) Restorative Justice and Responsive Regulation. New York: Oxford University Press. H. Strang and J. Braithwaite (eds) (2002) Restorative Justice and Family Violence. Melbourne: Cambridge University Press. J. Braithwaite (2002) ‘Setting Standards for Restorative Justice’ British Journal of Criminology 42(3), 563-577. J. Braithwaite (2002) ‘Restorative Justice and Therapeutic Jurisprudence’ Criminal Law Bulletin 38(2), 244-262. J. Braithwaite (2002) ‘Restorativna I reaktivna u cilju uspostavljanja mira u svetu’ Temida 2(4), 3-28. J. Braithwaite and H. Strang (2002) Restorative Justice and Family Violence in H. Strang and J. Braithwaite (eds) Restorative Justice and Family Violence, 1-22. Melbourne: Cambridge University Press. J. Braithwaite (2002) In Search of Restorative Jurisprudence in L. Walgrave (ed.) Restorative Justice and the Law, 150-167. Collompton, Devon: Willan Publishing. J. Braithwaite (2002) Linking Crime Prevention to Restorative Justice in J. Perry (ed.) Restorative Justice: Repairing Communities Through Restorative Justice. Lanham, MD. : American Correctional Association. J. Braithwaite (2002) Restorative Justice in P. Bean (ed.) Crime: Critical Concepts in Sociology. London: Routledge. H. Strang and J. Braithwaite (eds)(2001) Restorative Justice and Civil Society. Melbourne: Cambridge University Press. J. Braithwaite (2001) ‘Youth Development Circles’ Oxford Review of Education 27(2), 239-252. J. Braithwaite (2001) ‘Restorative Justice and a New Criminal Law of Substance Abuse’ Youth and Society 33(2), 227-248. J. Braithwaite (2001) Intention Versus Reactive Fault in N. Naffine, R. Owens and J. Williams (eds) Intention in Law and Philosophy. Ashgate, Dartmouth: Aldershot. J. Braithwaite (2001) Reconciling Models: Balancing Regulation, Standards and Principles of Restorative Justice Practice in H. Mika and K. McEvoy (eds) International Perspectives on Restorative Justice Conference Report, 16-25. Belfast: Queen’s University. J. Braithwaite, and D. Roche (2001) Responsibility and Restorative Justice in G. Bazemore and M. Schiff (eds) Restorative Community Justice: Repairing Harm and Transforming Communities. 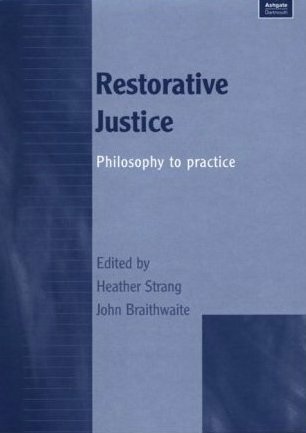 Cincinnati: Anderson Publishing Co.
H. Strang and J. Braithwaite (eds)(2000) Restorative Justice: Philosophy to Practice. Ashgate, Dartmouth: Aldershot. J. Braithwaite (2000) ‘Survey Article: Repentance Rituals and Restorative Justice’ Journal of Political Philosophy 8(1), 115-131. J. Braithwaite (2000) ‘Shame and Criminal Justice’ Canadian Journal of Criminology 42(3), 281-298. J. Braithwaite (2000) ‘Restorative Justice and Social Justice’ Saskatchewan Law Review 63(1), 185-194. (Reprinted in E. McLaughlin, R. Fergusson, G. Hughes and L. Westmorland (eds) (2003) Restorative Justice: Critical Issues. London: Sage). J. Braithwaite (2000) ‘Decomposing a Holistic Vision of Restorative Justice’ Contemporary Justice Review 3(4), 433-440. J. Braithwaite (2000) Democracy, Community and Problem Solving in G. Burford and J. Hudson (eds) Family Group Conferencing: New Directions in Community-Centered Child and Family Practice. New York: Aldine de Gruyther. J. Braithwaite (1999) ‘Restorative Justice: Assessing Optimistic and Pessimistic Accounts’ in M. Tonry (ed.) Crime and Justice: A Review of Research vol 25, 1-127. (Reprinted in Chinese by L. Shanshan (2007) Forum on Restorative Justice, Volume 3 (1100), China University of Political Science and Law). L. Walgrave and J. Braithwaite (1999) ‘Guilt, Shame and Restoration’ Justitiele Verkenningen 25(5), 71-80. J. Braithwaite (1999) ‘A Future Where Punishment is Marginalized: Realistic or Utopian?’ UCLA Law Review 46(6), 1727-1750. J. Braithwaite and C. Parker (1999) Restorative Justice is Republican Justice in G. Bazemore and L. Walgrave (eds) Restorative Juvenile Justice. Palisades, New York: Criminal Justice Press. J. Braithwaite (1998) ‘Education, Truth, Reconciliation: Comment on Scheff’‘ Revista Juridica Universidad de Puerto Rico 67(3), 609-614. J. Braithwaite (1998) ‘Restorative Justice’ in M. Tonry (ed.) The Handbook of Crime and Punishment, 323-344. New York: Oxford University Press. J. Braithwaite (1997) ‘Conferencing and Plurality’ British Journal of Criminology 37(4), 502-506. J. Braithwaite (1997) ‘Commentary: law, morality and restorative justice’ European Journal on Criminal Policy and Research 5(1), 93-98. J. Braithwaite (1996) ‘Restorative Justice and a Better Future’ Dorothy J. Killam Memorial Lecture, Dalhousie University, 17 October. J. Braithwaite (1996) ‘Searching for Epistemologically Plural Criminology (And Finding Some)’ Australian and New Zealand Journal of Criminology 29(2), 142-146. J. Braithwaite (1996) ‘Restorative Justice and a Better Future’ The Dalhousie Review 76(1), 9-32. (Reprinted in E. McLaughlin, R. Fergusson, G. Hughes and L. Westmorland (eds)(2003) Restorative Justice: Critical Issues. London: Sage). J. Braithwaite (1995) ‘Resolving Crime in the Community: Restorative Justice Reforms in New Zealand and Australia’ in C. Martin (ed.) Resolving Crime in the Community Mediation in Criminal Justice. London: Institute for the Study and Treatment of Delinquency. J. Braithwaite (1995) Diversion, Reintegrative Shaming and Republican Criminology in Günter Albrecht and Wolfgang Ludwig-Mayerhofer (eds) Diversion and Informal Social Control, 141-158. Berlin: Walter de Gruyter. J. Braithwaite (1995) ‘Restorative Justice’ in F.W.M. McElrea (ed.) Re-thinking Criminal Justice vol 1. Justice in the Community, 14-18. Auckland: Legal Research Foundation. J. Braithwaite (1994) ‘Applying Some Lessons from Japanese and Maori Culture to the Reintegrative Shaming of Criminal Offenders’ Japanese Journal of Criminal Psychology 32, 181-96. J. Braithwaite and S. Mugford (1994) ‘Conditions of Successful Reintegration Ceremonies: Dealing with Juvenile Offenders’ British Journal of Criminology 34, 139-171. (Reprinted in D. Karp (ed.) (1998) Community Justice: An Emerging Field. New York: Rowman and Littlefield. Reprinted in K. Laster (2001) Law as Culture. Sydney: Federation Press. Reprinted in I. Weijers (red. )(2005) Het herstelgesprek bij jeugdige delinquenten. Amsterdam, B.V.: Uitgeverij SWP. Reprinted in C. Hoyle (ed. )(2009) Restorative Justice: Critical Concepts in Criminology. Oxford: University of Oxford Centre for Criminology). J. Braithwaite and K. Daly (1994) Masculinities, Violence and Communitarian Control in T. Newburn and B. Stanko (eds) Just Boys Doing Business? 221-251. London: Routledge. (Reprinted in M. Valverde, L. MacLeod and K. Johnson (eds)(1995) Wife Assault and the Canadian Criminal Justice System and translated to Serbian in Temida 4(2) 2002). J. Braithwaite (1994) Thinking Harder About Democratizing Social Control in C. Alder and J. Wundersitz (eds) Family Conferencing and Juvenile Justice: The Way Forward or Misplaced Optimism? Canberra: Australian Institute of Criminology. J. Braithwaite (1993) What Is to be Done about Criminal Justice? in B. Brown and F. McElrea (eds) The Yough Council in New Zealand: A New Model of Justice. Auckland: Legal Research Foundation. 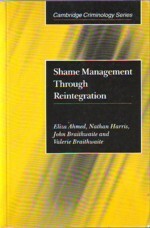 J. Braithwaite (1989) Crime, Shame and Reintegration. Cambridge: Cambridge University Press.